An artist's illustration of the alien planet UCF 1.01, a potential exoplanet 33 light-years from Earth that may be covered in lava. 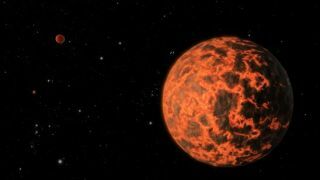 Scientists have discovered what appears to be an alien planet just two-thirds the size of Earth, a heat-blasted world perhaps covered in molten lava, a new study reports. Astronomers discovered the newfound alien planet, known as UCF-1.01, using NASA's Spitzer Space Telescope. The diminutive world is just 33 light-years away, making it a near neighbor of Earth in the cosmic scheme of things. "We have found strong evidence for a very small, very hot and very near planet with the help of the Spitzer Space Telescope," study lead author Kevin Stevenson, of the University of Central Florida (UCF) in Orlando, said in a statement. "Identifying nearby small planets such as UCF-1.01 may one day lead to their characterization using future instruments." UCF-1.01 remains a planet candidate — rather than an officially recognized planet — because researchers have yet to measure its mass. But the discovery team thinks it's the real deal. Stevenson and his colleagues weren't looking for new planets when they found UCF-1.01. It popped up unexpectedly in Spitzer observations of the Neptune-size exoplanet GJ 436b. The researchers noticed slight, periodic dips in the infrared light streaming from GJ 436b's red dwarf parent star, indicating some small body was blocking the star's light. Other instruments, including NASA's prolific Kepler space telescope, commonly use this "transit method" to find new exoplanets. By studying these brightness dips in detail, the team was able to determine several basic properties of UCF-1.01. The planet's diameter is likely about 5,200 miles (8,400 kilometers), making the world two-thirds as wide as Earth. But UCF-1.01 is not very Earth-like. It sits just 1.7 million miles (2.7 million km) from its parent star, completing one orbit every 1.4 days. So it's likely a scorched, baking world with surface temperatures exceeding 1,000 degrees Fahrenheit (540 degrees Celsius), researchers said. If UCF-1.01 ever had an atmosphere, it almost certainly has boiled away by now, researchers added. The astronomers also noticed hints of a third planet around the star GJ 436 — another tiny planet candidate they're calling UCF-1.02. But data for UCF-1.02 are more incomplete; for example, the team couldn't estimate its orbital period. If UCF-1.01 ends up being confirmed, it will be among the smallest planets ever discovered beyond our solar system. The title is currently held by a planet found by Kepler called KOI-961.03, which is just 57 percent as wide or Earth, or about the size of Mars. The study has been accepted for publication in the The Astrophysical Journal.